Here's a few tricks to making perfect morning sunshine eggs! Heat a non-stick griddle to 250 degrees and grease surface with a bit of non-stick spray or a pat of butter. You’ll be cooking these eggs “on low and slow”. 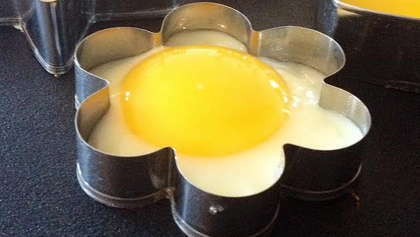 Place cookie cutters on griddle and carefully crack an egg into each one. When eggs are ready to desired doneness, grasp cookie cutters using tongs. Gently release eggs using a butter knife, sprinkle with salt and pepper, and serve with whole grain toast and fresh fruit.